On May 26, Kelly Schnapp, who directs OSHA's Office of Science and Technology Assessment, joined four other experts on a White House webinar highlighting the risks of extreme heat to four vulnerable populations: the elderly, athletes, emergency responders, and outdoor workers. Schnapp noted that a majority of recent heat-related deaths investigated by OSHA involved workers on the job for three days or less – highlighting the need for employers to ensure that new workers become acclimated to the heat when starting or returning to work. OSHA also provided heat safety tips for workers in a blog, Twitter posts, and an updated heat campaign webpage that now includes illustrations of heat exhaustion and heat stroke, an animated video, training resources, and links to an updated heat safety phone app. #WaterRestShade is the official hashtag of the campaign, encouraging employers to provide their workers with drinking water, ample breaks, and a shaded area while working outdoors. OSHA also continues to partner with the National Oceanic and Atmospheric Administration to raise awareness on the dangers of working in the heat through its Weather-Ready Nation campaign. Pennsylvania contractors Penn Stucco Systems Inc. and BC Stucco and Stone were cited and fined after OSHA inspectors found that the companies exposed workers to safety hazards. The agency responded to a complaint that employees were working on a scaffold more than 20 feet high without guardrails, bracing or restraints. Penn Stucco was hired by the general contractor to complete stucco work on a building in Philadelphia. Penn then hired BC Stucco and Stone to provide the labor. Other violations include not providing workers with fall protection and using scaffolds without ladders, stair towers or other safe means of access. Penn Stucco was fined $119,790; and BC Stucco and Stone, $116,600. Both companies were cited in 2013 and 2014 for similar violations. Read the news brief for more information. Pier 1 Imports' Glendale, Wis., location is the latest to receive OSHA citations after inspectors found blocked exit routes and boxes piled at dangerous heights. Inspectors also found stair and storage areas without railings, blocked electrical panels, and electrical boxes without covers. The home décor retailer has been cited for similar violations at several other locations nationwide. The Glendale store received eight violations and $101,420 in proposed fines. More information is available in the news release. A 30-year-old employee of Nature's Path Foods Inc. was injured when the blade from a machine he was cleaning cut off three of his fingertips. Inspectors determined that the incident could have been prevented if the machine had been powered down. OSHA cited the company for 17 violations including failing to: provide lockout equipment to prevent unintentional operation; install adequate machine guarding; conduct periodic inspections of energy-control procedures; and train workers on hazards from chemicals used in the workplace. The agency proposed $118,320 in penalties. Read the news release for more information. After receiving a complaint about unsafe working conditions, including blocked fire exits, OSHA responded with an investigation of the Oaxaca Mexican Products distribution warehouse in Passaic, N.J. OSHA inspectors found numerous safety hazards at the facility, citing the company for 24 violations including a willful citation after finding an exit door and route obstructed by locking devices that require special knowledge and tools to open in case of emergency. OSHA previously cited the company for the same type of condition on the same door. Total proposed penalties amount to $112,700. For more information, read the news release. Virginia Occupational Safety and Health issued $84,000 in penalties to Marvin’s Affordable Pallets in Richmond for exposing workers to workplace safety and health hazards. VOSH inspectors determined that the company failed to establish a program to prevent the sudden activation of machinery during maintenance, train workers on the control of hazardous energy, and to have an individual certified in and able to render first aid. The company also had not ensured that each powered industrial truck operator was properly trained and competent to operate the vehicles safely. The Washington Division of Occupational Safety and Health fined The Roof Doctor Inc. of Olympia $427,000 for exposing workers to fall hazards without adequate fall protection. Inspectors concluded that the company exposed six workers to fall hazards from heights at a residential worksite and failed to train workers in how to use fall protection equipment. The company has been previously cited for the same fall protection hazards. For more information, read the Washington DOSH news release. OSHA has ordered Polar Service Center to reinstate a safety manager at its Lansing, Ill., facility and pay $190,547 in back wages and damages. The action comes after a federal investigation found that the commercial tank trailer company violated the whistleblower provisions of the Surface Transportation Assistance Act. The company demoted, censured and ultimately forced the manager to resign after he reported to the U.S. Department of Transportation that he suspected a Polar customer was improperly certifying trailers to haul hazardous waste. For more information, read the news release. OSHA will hold a meeting of the National Advisory Committee on Occupational Safety and Health, June 14-15 in Washington, D.C. The tentative agenda for the committee meeting includes: an update on OSHA initiatives from Assistant Secretary of Labor for Occupational Safety and Health Dr. David Michaels; remarks from Director of the National Institute for Occupational Safety and Health Dr. John Howard; an update on OSHA's major regulatory activities; and reports from the NACOSH Emergency Response and Preparedness Subcommittee and NACOSH Injury and Illness Prevention Program Work Group. NACOSH will meet in Surface Transportation Board Hearing Room 120C, Patriots Plaza I, 395 E Street, SW, Washington, DC 20024. The Injury and Illness Prevention Program Work Group will meet from 1 p.m. to 5 p.m., June 14 and the full committee will meet from 9 a.m. to 5 p.m., June 15. Both meetings are open to the public. Comments and requests to speak at the NACOSH meeting must be submitted by June 3 at www.regulations.gov, by mail or facsimile. See the Federal Register notice for details. A team of Oregon safety professionals will host the Blue Mountain Occupational Safety & Health Conference, June 6-7 in Pendleton, Ore. The 10th annual conference will provide safety training on topics including safety and health hazards of welding; control of hazardous energy; respiratory protection safeguards and machine guarding. The keynote address will focus on reducing injuries and illnesses through changing safety culture and awareness. The conference will also feature a forklift safety competition and exhibits displaying safety and health products. The conference is a joint effort of Oregon OSHA, the Oregon Safety and Health Achievement Recognition Program Alliance, and a coalition of employers and workers from northeast Oregon. For more information, see the news release. OSHA joins the National Safety Council and thousands of organizations across the country in recognizing June as National Safety Month. 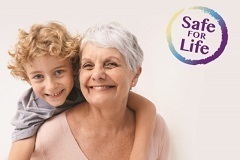 As part of an effort to emphasize the importance of safety both on and off the job, NSC's SafeForLife campaign highlights the leading causes of injury and death at work, on the roads, and in our homes and communities.Visit the SafeForLife website to take the SafeAtWork pledge and access downloadable materials including posters, tips sheets and games. You will also find a video, infographic and webinar taking place on June 14. A new NSC Safety Checkup web app provides a custom report on your specific safety risks. 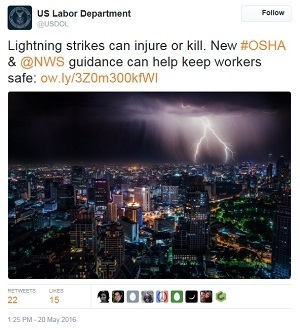 OSHA and the National Oceanic and Atmospheric Administration have released a Lightning Safety When Working Outdoors Fact Sheet that provides employers and workers with information about lightning hazards and protective measures that can be taken to ensure workers’ safety. Often overlooked as an occupational hazard, lightning strikes can severely injure or kill workers in occupations such as construction, logging, utility repair, agriculture, telecommunications, lawn services, airport ground operations, and pool and beach lifeguarding.